If you haven't yet made the transition from synthetic to wool base layers, SmartWool's Microweight Crew makes a compelling argument. For some of us the word 'wool' still conjures up associations of those awful heavy, itchy sweaters our moms made us wear to church every Sunday. I swore off wool for the better part of my young adulthood once I got to pick my own clothes—and remain a skeptic to this day. But it's true: SmartWool's specially-processed New Zealand Merino delivers itch-free comfort that rivals cotton. And Merino also comes with performance advantages over synthetic base layers—particularly with regard to moisture management. 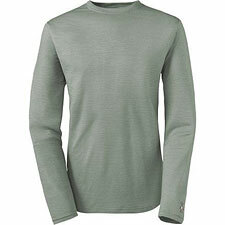 SmartWool's Microweight Crew does a superior job wicking moisture away from your body and allowing it to evaporate. You will often stay drier overall and be more comfortable in a wool top. When wool does get wet, it maintains a high percentage of its insulating value, unlike synthetics, which helps prevent the chills when you stop to rest. The Microweight works well as a stand-alone top in warm weather, or wear it as a next-to-skin base layer beneath your traditional fleece insulation on colder days. I've found SmartWool garments so comfortable I enjoy wearing them around the house—not just as performance wear in the backcountry. I also notice that I sleep far more comfortably in wool than in synthetics when I'm in a sleeping bag. Even my best synthetic long underwear feels clammy in comparison. Wool as a rule outperforms synthetics and cotton in odor management as well. Wool underwear generally weighs more than equivalently-warm synthetic gear—one of its few disadvantages. In the case of SmartWool's Microweight series, however, the weight is roughly the same as an ultralight synthetic top. The microweight fabric is so light it dries remarkably fast when it does get wet—almost as fast as synthetic garments. As for care, SmartWool says their clothes are drier-safe. However, I find that it's best to air dry your wool tops and bottoms to preserve their soft texture. The situations in which a synthetic fabric clearly outperforms wool are becoming fewer and fewer. If you're still holding out because of bad memories, give SmartWool's new microweight Merino gear a try. You won't regret it!